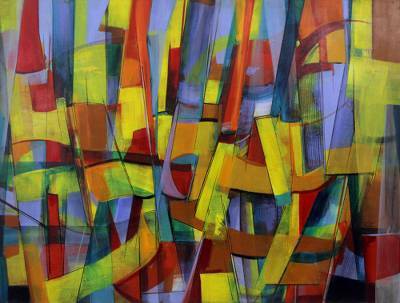 Modern Abstract Painting in Acrylics from Brazil, "Prismatic"
Golden prisms capture sunshine, transforming it into energized beams of colorful light. Verita creates an ambience of dynamic luminescence and expansive movement. Her bold, liberated brushstrokes vie for attention in a composition that sizzles with life. You can find 'prismatic' by Verita in paintings categories such as Abstract Paintings, Abstract Paintings and Acrylic Paint Paintings. Enjoy exploring these sections for other Novica treasures.